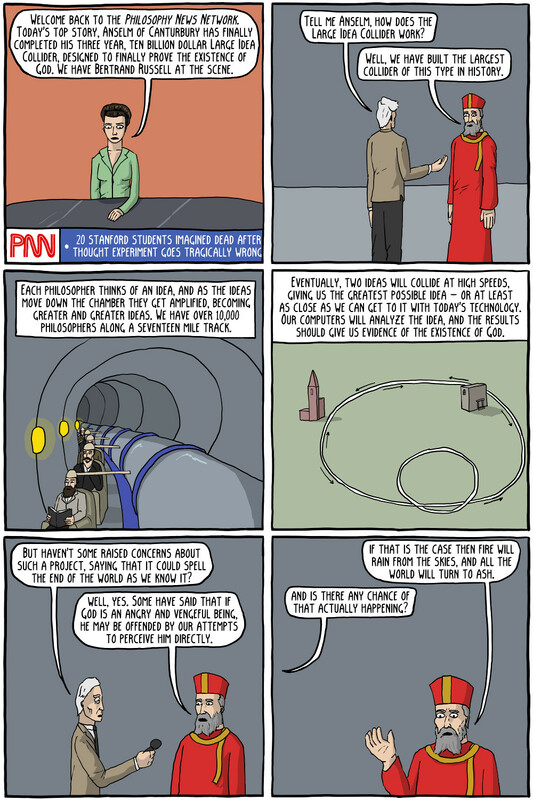 The comic is largely parodying the Large Hadron Collider, and Anselm's Ontological Argument. Camus's report on sports is a direct quote from Jean-Paul Sartre's review of The Stranger. According to Sartre, we are given the description of the events in Meursault's life, but are denied the narrative of why he is doing what he is doing. We are denied the meaning of his actions. 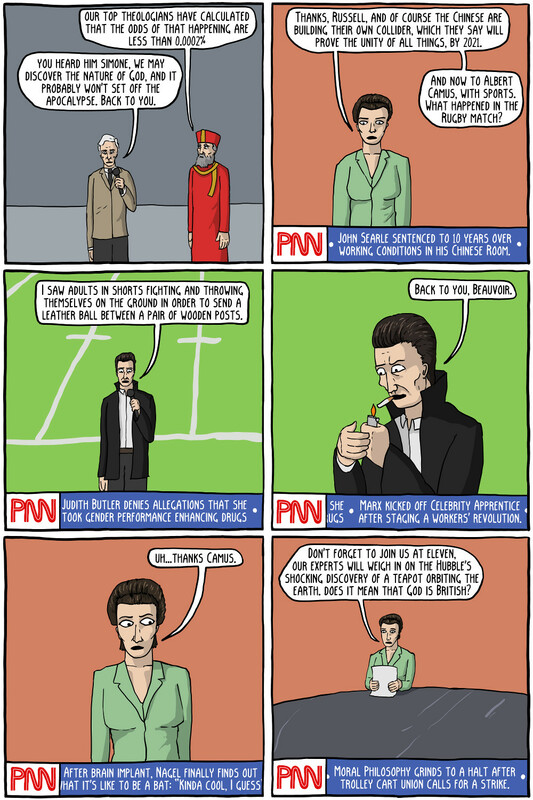 Sartre complains that this is similar to the joke about the rugby match, where omitting the information can be amusing, but doesn't reveal that the rugby match lacks ultimate meaning. For Sartre, the meaning of the game is just as true as the literal events in the game. That the players are trying to score points, win the game, rallying from a deficit, are all true statements. They are just as real as statements like "a leather ball went through two wooden posts", in fact they are more true, as they capture a more in depth account of reality. So while Meaursault may apparently lack any meaningful explanations for his actions, this fails to convince the reader who understand human relations better than Meaursault that such explanations are somehow fictitious. I highly recommend reading Sartre's full review to anyone who has read The Stranger. It can probably be found online, but I read it in my copy of Existentialism is a Humanism. It's far from entirely negative, although there are some pretty funny jabs in there, where you can see Sartre's feeling that he is intellectually superior to Camus, such as: "Camus seems to pride himself on quoting Jaspers, Heidegger, and Kierkegaard, whom he seems not always to have understood." The end of the comic is a reference to Russell's Teapot. The ticker jokes reference things like The Chinese Room thought experiment, Gender performativity, What is it Like to Be a Bat?, and The Trolley Problem.